Today I want to share a recipe that is new for me, something I made for Christmas dinner that I’ve never made before – Candied Yams. I don’t know why I decided to make them. My husband was actually not too thrilled when I told him we were having yams with our spiral ham on Christmas Day. “I don’t think I like yams,” he said. I made them anyway, but made sure we also had mashed potatoes and gravy as well as a vegetable that I know he likes to round out the meal. Since I had never made Candied Yams before, I had a little research to do. I started by asking the produce guy at my local Safeway whether I should use yams or sweet potatoes for the dish that has little marshmallows on top. He said to use yams, so I bought three big ones. I ended up only using two of them. Next, I searched the Internet for various recipes for Candied Yams (many of which called for sweet potatoes). I found a variety of recipes and eventually created my own based on a conglomeration of the ideas I’d gleaned from the recipes I read. This recipe is the result. I think it turned out pretty good, and my husband even ate some and said they were good. My son liked them, too. There are only three of us so there were lots of leftovers. A big family dinner would be a better time to make these Candied Yams. Peel yams and cut into cubes. Boil in enough water to cover, with a little salt, until yams are tender. Drain and return to pan. Add pineapple tidbits and juice, brown sugar, pecans, nutmeg, and salt. Mash and combine with a potato masher. Turn yam mixture out into an 8″ square baking dish. Bake for 1 hour in 275° oven (if also baking a spiral ham) or for 35 to 40 minutes in a 350° oven (if also cooking a roast or turkey). Remove from oven and cover the top with little marshmallows. (If you want to, you can line them up all nice and neat, but I didn’t have the patience for that, so I just poured a bunch out and made sure the top was covered). Return to the oven and broil on center rack on low broil heat for 5 to 10 minutes or until marshmallows are browned and a little bubbly. Remove from oven and let cool a few minutes before serving. Note that this dish really holds its heat – we all almost burned our tongues on it. This entry was posted in Recipe and tagged Baking, Candied Yams, Christmas, Christmas Dinner, Cooking, Eating, Family, Food, Gratitude, Life, postaday2011, Recipe, Recipes, Spiral Ham, Yams. Bookmark the permalink. Well, now I know I’m not crazy after all, what a relief! I’m having yams with my spiral ham dinner on New Year’s Day! And I’m making au gratin potatoes, as well (homemade, if you’re curious). Green beans, and probably black eye peas–because I grew up thinking it was a law. And a homemade pecan pie (though I cheat and buy the roll-out pie crust in the dairy case). Thanks so much–and you have a wonderful New Year’s!! A million thanks for the tip on Marie’s frozen crust–this will save me a lot of grief next year!! It never occurred to me to check the frozen aisle! Two hours till my guests get here, and I’m sick with a cold–can’t believe it! Never mind–I think the black eye peas will be good–I got a frozen bag, sauted a bit of red onion in bacon grease, then poured the drippings from the ham & just a little water over the peas & onion, and let them marinate in the fridge overnight–I’ll just warm them up today!! Thanks again–Lord bless you! God bless you and yours as you share recipes with us! 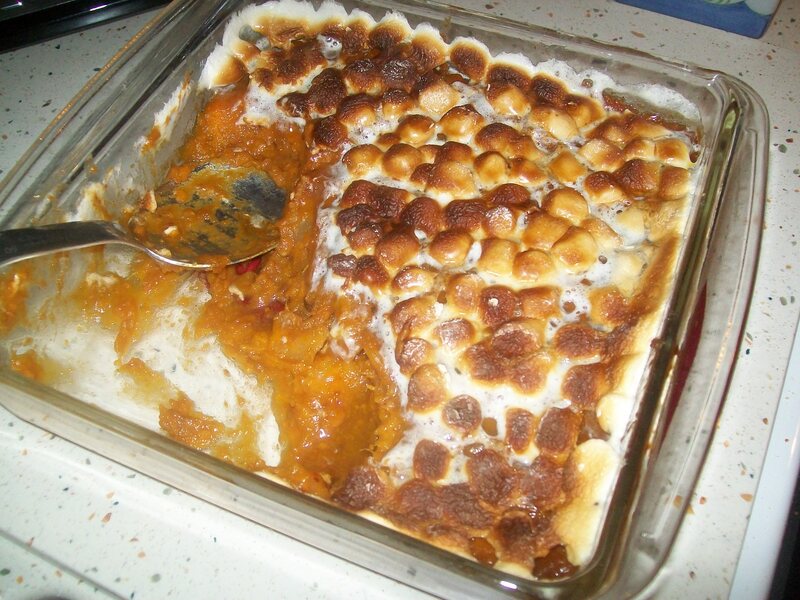 I love candied yams, and really enjoyed your fb pic of the family enjoying them together. Your remark about combining ideas from web recipes is a marvel to me. That type of thing is a talent you’re either born with or not.